A SKY FOR US ALONE by Kristin Russell is a YA coming-of-age novel filled with mystery and heartache. It’s set in a poor section of Appalachia that’s run by the mines and the man who owns them. When Nate, Harlowe’s older brother, starts searching for a way to get out, he ends up with a bullet through the chest. Determined to figure out why Nate was killed, Harlowe sets out on a mission to uncover the truth, but gets sidetracked when he meets Tennessee, a beautiful girl with her own problems. Though he’s drawn to her, the more he gets tangled in her web and the more he pokes into places he shouldn’t, the more likely he’ll face the same fate as his sibling. The setting is very much a character in this story and I love that readers get a rare look into this unique part of the United States. It’s gritty, polluted, and destitute. Fruits and vegetables can’t grow there anymore, and even if they did, residents couldn’t afford them. The soil and water are poisoned with yellow boy and cancer is a rite of passage. People are addicted to cigarettes and pills and have to squeeze their families into cramped trailers. In many ways, they are stuck in modern slavery, and it’s upsetting to know that we as humans are allowing others to live like that. This book, though fictional, highlights both their struggles and strengths, giving the people of Appalachia a voice. Most of the characters are so vibrant with their own wants and needs that I can easily picture them. In fact, they could jump right off the page and into real life. The only character with fractured development is Nate. His introduction in the first chapter feels like a plot device to evoke sympathy for what’s to come, but it backfires. His abrupt death is jarring for me and makes the first chapter almost unnecessary. Russell could have started with Harlowe finding Nate’s body and the book wouldn’t have lost anything. There are numerous other plot points that I have trouble buying, most of them relating to Tennessee. For example, I don’t believe someone would essentially fall in love on the same day he buries his brother, especially if it is sudden and involves foul play. I also don’t believe Harlowe’s totally invested in finding answers when he gets so distracted by Tennessee and lets someone not calling him back stop him. For as much as Harlowe claims he loves building furniture, he does it for maybe a few minutes in the entire book and puts more energy into a new pie selling business instead. This wishy-washiness is distracting. Russell ends the novel on a promising note. We don’t know what’s going to happen to Harlowe, but he’s taking his destiny into his own hands, reminding us that life is what we make it. No matter our circumstances, there is still plenty we can control and there’s hope for us yet. 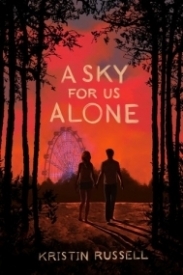 A SKY FOR US ALONE will make readers appreciate the small things, call a family member to check in, and encourage people to pursue their dreams. Kristin Russell may not have set out to make a positive impact on readers, but there’s no denying that she has. Love Stories: How Do I Tell?